The complete 2013 Wisconsin Crop Manager Volume 20 is now available on our website as a single PDF. The first five pages are a Table of Contents listing every article and the page number it can be found on. To view or download all the articles from the 2013 Wisconsin Crop Manager in one PDF file, complete with a table of contents, click on the link below. 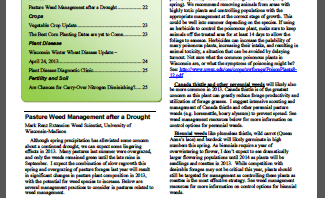 2013 Wisconsin Crop Manager compiled articles as a single PDF, with table of contents.